Here are things to think about. The aspiration to ordain is beautiful and noble. Taking your time before you ordain supports your monastic life to flourish. What is required to ordain and live as a monastic? Leaving the home life to dedicate yourself to study, practice, and service takes commitment, courage, and faith based on reason. Renouncing the pleasures and illusions of cyclic existence and living in pure ethical discipline are particular qualities of monastics. Being willing to undergo hardships to develop spiritually indicates a special kind of spiritual longing. Treasure your aspiration and nurture it with careful consideration. 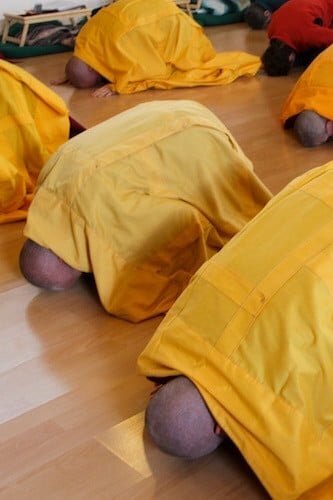 It’s essential to set a firm foundation of Buddhist practice before taking monastic precepts. Take your time. You need to establish a strong daily meditation practice and to know which Buddhist practices appeal to you most. Reflect deeply on the four noble truths to clarify your motivation. It’s also important to have a teacher. Before accepting someone as your teacher, you should know his or her qualifications and be familiar with his or her teaching style to be sure it suits your temperament. When that relationship is well established, discuss ordination with your Buddhist teacher and follow his or her counsel. 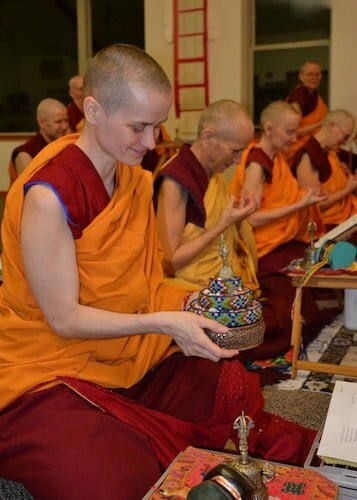 Before ordaining, you must also have confidence that the teacher will train you as a monastic and provide Dharma guidance. It is also imperative to put the proper conditions in place for post-ordination training. Where will you live? How will you be supported? Who will guide you in keeping the monastic precepts? There is no substitute for the value of living in a monastic setting after ordination. Explore the options thoroughly. The most important preparation is your motivation. In particular, strengthen your determination to be free from cyclic existence (renunciation) and your loving, compassionate motivation to attain Buddhahood for the benefit of all sentient beings (bodhicitta). To develop these, meditate daily on the stages of the path to awakening (lamrim). Focus especially on the eight worldly concerns and their antidotes, the disadvantages of cyclic existence, and the three higher trainings that lead us to liberation. Find these meditations on ThubtenChodron.org. By taking the time to set up supportive conditions, your Dharma aspirations become firm and your ordained life will flourish. Reflect and write out your thoughts on the questions in Preparing for Ordination. This booklet is found on the Thubten Chodron website. We can mail you a copy if you send your address and a donation to cover postage. Read Blossoms of the Dharma: Living as a Buddhist Nun , edited by Thubten Chodron. Although the book is out of print, it is available online. Read Bhikkhu, Thanissaro. The Buddhist Monastic Code. 1994. For free distribution, write to: The Abbot, Metta Forest Monastery, P.O. Box 1409, Valley Center, CA 92082, USA. 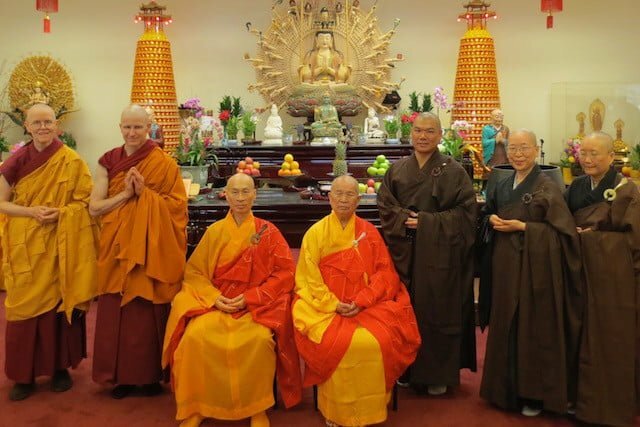 Do strong and continuous meditation on the Four Noble Truths, the Twelve Links, and the disadvantages of samsara in order to generate a firm determination to be free from samsara and attain nirvana, which is the motivation with which we receive ordination. Also do strong purification to eliminate hindrances to keeping the precepts and make strong prayers to be able to keep the precepts for the duration of your life. Establish a strong daily meditation practice and be under the guidance of a qualified teacher who will lead you on the path. Attend the “Exploring Monastic Life” program at Sravasti Abbey, held annually during August. Attend the preparing for ordination course at Tushita Meditation Centre in Dharamsala, India. It is usually held in January or February each year. For info, email Tushita. 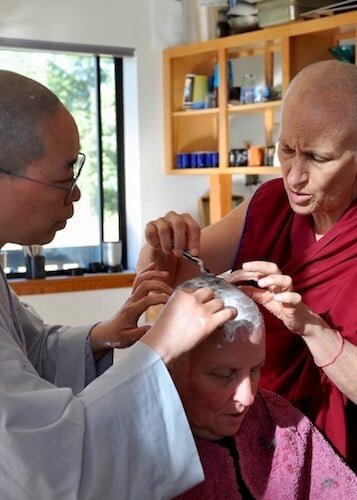 See the material about ordination and monastic life at ThubtenChodron.org.